Well, well, well. Check out what one of our tipsters sent us late last night. They were leaving the Illinois Education Association meeting in Normal last night when they saw Mike Frerichs get into his car. They snapped this pic with their iphone. 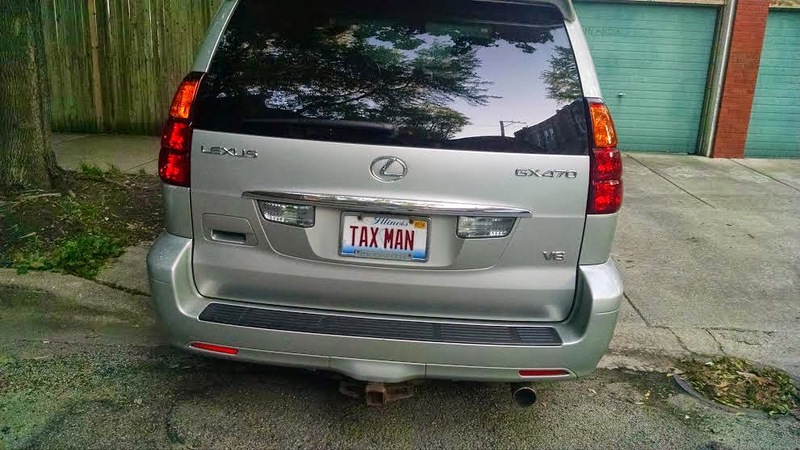 Check out his license plates! Mike Frerichs: (pulls license plates from envelope) Taxman? No, No...these don't belong to me. I'm not the Taxman. I think there's been a mistake. Clerk: What's your name again? MF: Mike Frerichs. Candidate for Illinois State Treasurer. Clerk: (nodding her head) Yes...Mike Frerichs. You are the Taxman. Clerk: Well, as far as the State of Illinois and voters are concerned, you are.